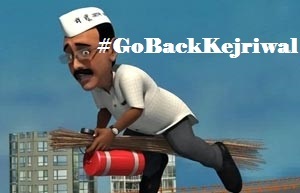 This hashtag #GoBackKejriwal sounds more like wat we read in History books for "Simon Go Back!!"...hillarious!! #GoBackKejriwal d last time i knew we had the right to go to all parts of our own nation. Bhaisahab India #Kisi ki jaagir nai hai!! I see this rather unnecessary hashtag on TL. We all know Kejriwal ! U turn le ke wapas jaayega hi ! then why #GoBackKejriwal? Bihar welcomes paapiyans with trend #GoBackKejriwal Cause Bihar knows tht they dont need Anarchy.